These ocean creatures are hiding under colorful wood chews and waiting for your bird to find them. Your bird will have so much fun digging in to grab the colorful sea creatures and then chewing on them. This parrot toy contains plastic sea creatures, 8 assorted wood chews and 8 colorful plastic keys. Under the Sea African Grey/ Severe Macaw Bird Toy5Diana S.July 24, 2017My CAG Chiyome loved this toy!! She has gone from being almost fearful of most toys to being interested and eager to play as I am taking them out of the box. This one was a big hit with her; she started chewing almost as soon as I had hung it in her cage. This is a definite must-buy-again toy!! Under the Sea African Grey/ Severe Macaw Bird Toy5JoAnn EAugust 26, 2016My sulphur crested cockatoo Randie, loves this bird toy! He is a big chewer, and this toy keeps his mind and beak busy. He is a happy boy. 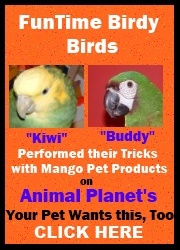 I will be back to buy Randie more bird toys! Under the Sea African Grey/ Severe Macaw Bird Toy5LindaApril 7, 2016Biff, my Blue front amazon loves these toys....they keep him busy for hours!